As across our two-island state, you gather with family and friends, I wish everyone a happy and healthy New Year. This is always a hopeful time, as we celebrate the end of one year and the beginning of another. We have good reason to be particularly hopeful for 2017, because we did so well in 2016. As the year ends, we are just two and half years into my government’s tenure, but already we witness the beneficial break from the past. Already, we see that our economy is growing, jobs are being created and the cost-of-living has been contained, with a low rate of inflation. Consumer confidence is strong with an increase in imports of 37 percent in 2016, over the previous year. Already, we know that our unemployment rate is lower than it has been in 9 years, and the rate of crime has dropped significantly. Already, more of our young people are getting higher education, medical facilities are better for our sick and our elderly, and we have the highest home and car ownership in the history of our country. As 2017 dawns, we have begun to build the economy of the future. It is an economy we can leave to our children, secure in the knowledge that they will have the means to survive and prosper. But, let me warn, that the responsibility to build a stronger Antigua and Barbuda resides with every one of us. My government can give leadership. We can implement effective policies. But, our nation has to advance beyond the actions of government alone. Every other sector of our society has to play a meaningful role, if our economy is to consolidate the growth trajectory that we have achieved in the last two and half years. If we truly want an economy that is vibrant and offers opportunity to all, we need a society rooted in responsibility, and a nation that lives as a community. That is not to say that there should not be differences within us or that criticism should not be made. Ours is an open and democratic society, and in such a society there is a legitimate place for disagreement, for debate and for dialogue. But they should be constructive. No nation is built on threats of terror. No nation is built by media that tears down, without also building up. No nation is built by blind refusal, to allow investment that can improve the lives of our people. The danger that confronts us is not that we cannot climb the hill to economic development and social betterment. The danger is that elements within our society, through acts of selfish irresponsibility, will block our path; retard our progress and trip us up along the way. That is what each of us has to guard against. A society rooted in responsibility puts the well-being of the people first; it places national development over political ambitions; it supports progress and rejects the demolishers; it gathers together in a mighty force that moves steadily forward. As the New Year dawns, the path to a strong economy lies before us. It awaits now only a responsible society to catapult us forward. The evidence is there for all to see. In 2016, according to the UN Economic Commission for Latin America and the Caribbean (ECLAC), the growth of the entire area contracted by 1.1% which, translates into a 2.2% decline in the earnings per head of population. Not so in Antigua and Barbuda. The same ECLAC confirmed that Antigua and Barbuda’s growth is 4.2% in 2016 – 3.1% above the average of the entire area of Latin America and the Caribbean, and the fastest in CARICOM. This year’s performance was not a one-off event. The average real economic growth rate for the period 2014 to 2016 is 4.25%. To understand the significance of this level of growth over the past 2.5 years, it should be recalled that, under the stewardship of former Finance Minister, Harold Lovell, the economy contracted by approximately 25%. He collapsed the economy and put 10,000 people out of work. As a consequence, thousands lost their vehicles, homes and businesses. Many families were left in difficult circumstances; their savings eroded and the quality of their lives diminished. That situation has been significantly reversed in 2 and a half years. What is even more spectacular, my government moved the economy from the worst performing in the world to one of the fastest growing. At no time in the history of the Caribbean has a government had to address fiscal and financial failure concurrently as my government did 2.5 years ago. Details of all that has been achieved will be provided in the National Budget in a few weeks’ time. First, in 2009, the country’s overall fiscal deficit was 16% of GDP or a deficit of almost $600M. This compares to a projected overall fiscal surplus in excess of 2% of GDP for 2016 – representing an 18% turnaround in this measure of fiscal performance. This is unquestionably a stunning accomplishment by any reasonable and objective analysis. Second, my government abolished personal income tax, despite objections from the very persons who had destroyed the economy for over a decade. Yet, tax revenue grew by about 13% from 2014 to 2016 while current revenue grew by 9%. Third, over the same period, the level of debt has been reduced, and the debt to GDP ratio has been lowered to 87% in 2016 – a decrease of 15 % from the 102% figure that my government inherited from Harold Lovell/UPP administration. Fourth, these improvements between 2014 and 2016 were achieved despite my Government having to invest $330M, to stabilize the banking sector and protect the savings of depositors. Had we not fixed this almighty calamity that Harold Lovell and the UPP dropped on us, it would have been a catastrophe for many hundreds of families, businesses and the economy as a whole. But, let me be clear, investing that money to save depositors from catastrophe and businesses from ruin, reduced the government’s capacity to raise funds for critical capital and social investment projects. That is why we have not been able to invest faster and wider in such projects over the last two years. Nonetheless we have done so, particularly in health facilities, education, electricity, water, housing and tourism. In the crucial area of water, in excess of $13M has been invested in a new Reverse Osmosis plant, which will provide an additional 2 million gallons of water per day early in the new year. In education, approximately $15 million has been spent in upgrading and expanding the secondary school plant, providing classrooms to accommodate an additional one thousand students. In health, in addition to the $30M in diagnostic equipment, we have employed more specialist doctors and improved and expanded the services at the Mt St John Hospital. In tourism, Antigua and Barbuda has been rated one of the best performing destinations in 2016, with record levels of stay over arrivals. We invested $81M to extend the Heritage Quay Pier and to Dredge the harbour to accommodate the larger cruise ships, now plying the seas, bringing increased numbers of visitors. All of this contributed to the well-being of our people; increased employment; more income for businesses; and growth in the economy. Amid all this, the turn-around in several of our statutory corporations is remarkable and noteworthy, driven by improved management, an end to waste and corruption, and the introduction of best business practices. Antigua Port Authority will turn a profit of a few million dollars; it is no longer reliant on a $10M bank overdraft to fund its operations. State Insurance Corporation turned a profit of approximately $11M in 2016, so much so, that it was able to pay in excess of $9M in dividends to the government for 2015. WIOC is expected to show a year-end profit of approximately $18M and will make another dividend payment to the government by April 2017, exceeding the sum of $5.5M paid a week ago. WIOC also paid EC$8M in corporation taxes. By any measure, to achieve so much has been a phenomenal task, particularly given the necessity to rescue the country from the economic and financial mess that the UPP administration left behind. No nation can recover if it does not reform itself. In the last 2 and a half years, we have laid the foundation for reform and recovery. The UPP naysayers said it could not be done – we said that it can be done. We branded our government as a ‘Can-Do’ government because we believe in the creativity, talents, indomitability and resilience of our people. In 2.5 years, we have been saddled by the mess they left behind. We must continue to highlight the mess Lovell and the UPP left behind, so that you can understand the significance of your contribution in rescuing our country. And, sadly, those who created the mess in the first instance, have the shamelessness to criticize, even when success stares them in the face. But we have not been deterred or derailed. We are dealing with the issues systematically, while we continue to grow our economy and develop our country. We must now turn our efforts to the prospects for 2017. None of us should doubt that, in the international context, we enter a time of unpredictability that could alter the world order as it has existed for more than half a century. Undoubtedly, such an environment will bring many challenges, but it could also be ripe with new opportunities. Navigating the uncharted waters, and keeping our ship of state afloat will require astute and alert leadership, ready to take advantage of possibilities that might arise and prepared to guard against threats that might be posed. That is the leadership my government will strive to give. In doing so, we invite the business community, the trades union movement, and other civic organizations to join the effort. It requires the effort of all. That effort is also necessary in the domestic context. The demolishers and destroyers among us prey upon differences in our society, giving such differences greater importance than our similarities. But, in making our nation productive; in giving all in our society the opportunity to rise; we should reject dwelling on differences and, instead, build on our shared aspirations and ambitions. From my own perspective, I see our nation as one; one nation, one people with a common destiny. One nation with our people as the weave in its rich tapestry; our society as cohesive in its knit of family and faith, freedom and responsibility. It is a “One-nation Antigua and Barbuda” that we are building together. An all inclusive economic powerhouse, a harmonious society, with equality of opportunity and justice, irrespective of colour, creed or class. A cohesive society where all are lifted up and none are held back. In 2017, I want Antigua and Barbuda to improve from the fourth fastest growing economy in Latin America and the Caribbean to the number one position. That is the objective we have set. I remind that ECLAC has found that we are only behind the Dominican Republic, Panama and Nicaragua in all of Latin America and the Caribbean and ahead of the other 28 countries, including Mexico and Trinidad and Tobago. Our Government’s strategy in 2017 is to ensure fiscal and debt sustainability, while pursuing a growth and development agenda. Because there cannot be any sustainability without growth. In this regard, our fiscal stance will be balanced and pragmatic: securing long term sustainability, while ensuring that economic activity is not thwarted by an adjustment programme that is too aggressive. Let me now provide some insights of the cost-cutting and investment programme for 2017. Our Government will reduce operational costs in rental of offices and electricity. The UPP unfinished car park will be converted into an office complex to be occupied by Government offices instead of paying rent. Together with the State Insurance and Department of Marine Services buildings, occupation of these three facilities will reduce government rental costs by about $10million in 2018. Early in 2017, we will execute a US$15M concessional loan from the UAE, for a renewable energy programme utilizing both wind and solar resources. This will take Government offices and State Owned Enterprises off the APUA grid and will help to bring a halt to the mounting accounts payable bill for the public sector. On the investment side, my government is working to end water shortage problems by installing a third Reverse Osmosis plant by the end of 2017. We are moving to give the country the fastest and most affordable bandwidth to expand and improve telecommunications for business and social use. Tens of millions of dollars have already been invested in this undertaking. For many of the reasons I have already explained, my government has not been able to move as speedily as it would have liked to improve roads, curbs and drains left in deplorable conditions by the UPP, despite spending in excess of $1Billion in taxpayers’ money. But from 2017, these areas will be tackled. Several main arteries will be rebuilt from a grant of approximately $50 Million and a similar amount will be spent to improve community roads. To help achieve this, government has invested over $35M to establish its own concrete and aggregates production facility. On education, we live in an education age in which education must start at birth and continue throughout a lifetime. Nations that fail to educate and train their people will inevitably be left behind. I want at least one person in every family in our country to have a university degree. I want no child to believe that he or she is debarred from learning. That is why a further $15M will be spent in 2017 to upgrade the secondary schools plant, and a new secondary school will commence construction at Tomlinson’s. That is also why the university act will be passed in the first quarter of 2017, as we continue our march to establish the fourth campus of the University of the West Indies at five islands. 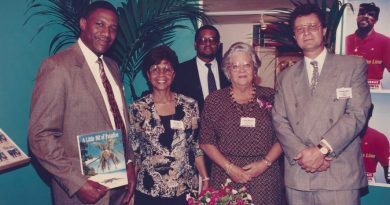 With regard to health, Mt St. John today, ranks as the number one health care facility among the countries of the Organization of Eastern Caribbean States. In 2017, we intend to improve it further with new services, including the capacity for kidney transplants. Tourism is the diamond in our treasure chest, and we need to continuously polish it to keep its lustre. Therefore, in 2017, we will construct a third cruise ship pier at Point Wharf to accommodate Oasis class ships. Those ships and the numbers of visitors they will carry, will dwarf the size and capacity of Anthem of the Seas, for whose calls we made provision in 2016. In 2017, we will also construct the newest and most modern cargo port facility in the region, at a cost of approximately $270 Million. Our purpose is to make our country a hub for cargo shipments, bringing more revenues, more jobs and contributing to the fulfilment of our vision as an economic powerhouse. I know there has been concern about the delays in several hotel projects that should have started by now. But, the laws of our country must be upheld. In this regard, delays have been caused by the time it takes for environmental impact studies to be completed, and for adjustments to be made. However, a number of hotel projects will begin construction in 2017 and these will, in part, fuel the anticipated robust economic growth. Barbuda will be the beneficiary of at least two hotel projects, including Paradise Found. It is as well that I remind everyone that large sums of money earn no interest or dividends for investors, if they are not invested and working. In this connection, those in Barbuda, who rail against these hotel projects, should understand that no one will leave their money idle. The proposed Hotels offer to Barbuda and Barbudans, sustainable jobs, income and a higher standard of living. All Barbudans should take advantage of the real opportunities these hotels provide while the investors are interested, and have bent over backwards to satisfy all major concerns. But, there is no use crying over spilt milk; and the longer that, unnecessary obstacles are erected, the more the likelihood that the milk will be spilt. No investor will wait interminably. To improve the prospects of Barbuda, the Government will upgrade the Port infrastructure in Barbuda, completing the logistical arrangements to make Barbuda a port of entry. Air Barbuda will also begin operations in early 2017, with fares heavily subsidized by the government to facilitate the movement of the Barbudan people to and from Antigua and beyond. With regard to housing; the National Housing Corporation is now completing the infrastructure at Dredge Bay and homes will be made available within the next 90 days. It is also anticipated that homes at Paynters and Cooks extension will become available later in 2017. Further, government will make available several hundred parcels of land at Friars Hill and Royals starting at an affordable price of $5.00 per square foot. We will also continue to make land available at $3.00 per square foot for development. This is to encourage increased entrepreneurship in building a stakeholder society. On crime, my government came into office on a mandate to reduce crime significantly. Strategies will be introduced to rid our streets of those criminal elements who, as a profession, prey on hard-working people, and particularly on our womenfolk. The Courts will be encouraged, through tougher legislation and other means, to apply stiffer penalties on those who commit gun crimes. 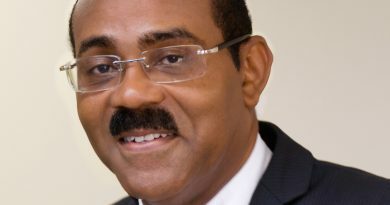 Antigua and Barbuda must be regarded by locals and tourists alike as a safe and secure place, where people are free to enjoy their social lives and to do business. Let criminal elements be warned, no one in our society will tolerate the disruption of peace, tranquility and freedom in this nation. Finally, I thank everyone in the public and private sectors for their contribution to the growth and expansion of our country’s economy in 2016. Your unstinting effort has placed our nation among the fastest growing economies in the world, and I am proud, privileged and pleased to lead that effort. I know well, that I needed your hand at the plough and your shoulder at the wheel, as I will do in 2017 and the years ahead. Together we have embarked upon a project to restore the wealth of our nation; to re-establish the standing of our country and to advance it; to include all in the circle of opportunity and give our people the success and prosperity they deserve. Together we aspire; together we achieve. God Bless you, and God Bless our beloved Antigua and Barbuda.